Redemptorist Author, Missionary, Pastor, Professor, and a Roman Catholic Priest who survived the sinking of the Andrea Doria, Rev. Joseph William Oppitz, CSSR, died on October 6, 2011 under the care of his religious community in the St. John Neumann Residence at Stella Maris in Timonium, Maryland. Father Oppitz was born on August 12, 1926 in Baltimore, Maryland. He professed his first vows on August 2, 1948 and final vows on September 2, 1951. He was ordained a priest on June 21, 1953 at Esopus, NY. From 1954 to 1956 he studied at the Angelicum in Rome where he received his doctoral degree in Philosophy. For nearly twenty-two years of his priesthood he taught at various levels in the Redemptorist seminary formation system of the Baltimore Province and at Dunbarton College in Washington DC. From 1982 to 1984 he served on the mission team and was a part-time parish priest at St. Peter the Apostle Parish in Philadelphia, PA and St. Wenceslaus Parish in Baltimore, MD. From 1985 to 1986 he served as parish priest in St. Mary’s in Annapolis. From 1986 to 1993 he continued to serve as a missionary and part-time parish priest in Ephrata, PA. 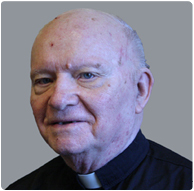 He continued to serve as a pastor in Pittsburgh, PA retreat master in Canandaigua, NY and itinerant missionary until his retirement in February of 2000 first to the St. John Neumann Residence in Saratoga Springs, NY and finally to Stella Maris in Maryland. He counseled the scrupulous and enlightened the curious at the Redemptorist Information Center in DC. His enthusiasm when preaching and teaching had a riveting effect on his listeners. No one ever fell asleep when Father Oppitz was in the pulpit or in the classroom. He introduced students to the importance of making fine distinctions. Under his tutelage they learned to distinguish between vincible and invincible and culpable and inculpable ignorance. When he taught ethics he offered practical examples of the principle of double effect and when he taught philosophy he expounded on the difference among essence, form, matter, substance, and accidents. But above all he prodded his pupils to learn how to think and to never be afraid to wallow in “wonder” which he insisted was the beginning of true wisdom. Father Oppitz is perhaps most fondly remembered for his captivating rendition of what he called “The Sinking of the Andrea Doria: One Man’s Story.” Here are a few excerpts from the tale in Father Joe’s own words. Only the men in my immediate family ever crossed the Atlantic by boat: my father, on a troop ship during the First World War, my brother on an L.S.T. during the Second World War, and myself on a vessel bound for its own battle with disaster in 1956. After defending my thesis in Rome, I traveled to Genoa to board the Andrea Doria and head for home. The ship was 697 feet long and had all the latest safety devices, the most recent and sophisticated radio and radar equipment, a series of up-to-date safety compartments, such that it would be impossible for the ship to ever sink. We left Genoa on July 17 but before heading out to sea we docked in Naples to welcome the last of our 1706 souls on board. As soon as the gangplank was fixed in place, about a dozen Neapolitan vendors came racing to the decks, each carrying a sack filled with souvenirs to be sold to those of us already onboard. The first merchant saw me and probably said to himself, “Aha, an American tourist for my first sale of the day.” He came on the run, opened his satchel, and started his pitch. “Authentic gold rings, bracelets of pure silver, diamond ear rings. Make your girlfriend happy!” I assured him that I had no girlfriend. His clever reply was: “Even Americans have mothers! So buy something for your mother.” I told him I had all the souvenirs I needed in my trunk down in the hold. Then he went on the attack: “That’s the trouble with you Americans! You come over here and you don’t respect our customs. And one of our customs is that if we do not make the first sale of the day, we will have bad luck. So you have to buy something!” I replied, “Look buddy, if you don’t stop bothering me, I’ll have that cop throw you off this ship and then you’ll really be in bad luck.” Well, I had heard some elegant curses in my travels, but this fellow topped them all. He spit on his index and middle finger and gave me the Malocchio—the “evil eye”—and yelled, “I hope you have bad luck on the way home.” There you have it. We were a cursed ship even before we launched into the Atlantic. The rest of the trip, until the night of July 24 and the morning of July 25, was delightful and uneventful. The weather was mostly sunny and warm, the waves were moderate and relatively calm, and we passengers were totally relaxed. The last day began with the usual sunshine. However, toward late afternoon a fog began to roll in on the horizon. By suppertime, the fog became one of the topics of conversation, especially among those of us who had never experienced fog at sea. It was discussed, not with any fear or apprehension, but rather with a sense of gratitude that we were on the Andrea Doria, a ship equipped with the very latest technology and a Captain with many years of experience. Indeed, I recall that before the final evening dinner, a group of us were talking about the fog, and one of the men, Mr. Cianfarra, a New York Times correspondent, joked that it would be nice if we had a collision in the fog so he could “scoop” the other reporters back in NYC. At 10 P.M., on July 25, the Andrea Doria was just one mile south of the Nantucket Shoals and the Nantucket Light. The area from the Nantucket Light to the Ambrose Light has been called the “Times Square” of coastal waters due to its heavy traffic in a somewhat confined space. Forty-five minutes later, our Captain Calamai saw a blip on his radar, roughly 17 miles away and bearing four degrees to his right. Whatever the ship was, it was on his starboard side and on a parallel course but heading toward Europe. Calamai was convinced that the two ships would pass each other with no chance of a crossing situation. On his radar there was about a half mile distance between the two ships. At 11:05, just six minutes before the collision, the Stockholm was four miles distant but bearing 14 degrees over the Andrea Doria’s right bow. Therefore, Calamai made a slight change in course to his left so as to place more water between the two ships as they passed right to right. Three minutes before the crash, the Stockholm was just 2 miles away but still could not be seen nor could any sound of its fog horn be heard. Our Captain stepped out unto the right wing of the bridge to see if he could sight this mystery ship. Finally he saw the glow of lights just 1.1 miles away and bearing directly over the Andrea Doria’s bow. This was just 100 seconds before the collision. At that moment it became obvious that the Stockholm was making a sharp right turn directly into us. Calamai ordered a hard left in a desperate effort to avoid a tragedy. Fifteen seconds more and the two ships would not have collided at all. The hard-left turn was the correct decision in what is called an “in extremis” condition. Calamai was probably praying for a miracle that would bring us safely away from the Stockholm’s icebreaker prow. That miracle never came. The Stockholm, at practically full speed, knifed almost halfway through the Andrea Doria’s right side just below the wing where Calamai had been standing. The collision took place at 11:20 P.M. The bow of the Stockholm was crushed in the impact making a huge hole in the Andrea Doria and ripping open her starboard side like a can opener. When the mangled Stockholm floated free, the ocean poured into the gaping wound of the Doria which made us list severely to the right. This happened so quickly that all the lifeboats on the port side became absolutely useless. As the Stockholm floated out of the wound it was obvious that it had lost 75 feet of its own bow. Another major problem was that, after the impact, the Stockholm could not be stabilized because its anchor had fallen. As it circled in the turbulence, it almost hit into us again! The majority of those who were killed were crushed to death in their beds. The “miracle girl” of the catastrophe was young Linda Morgan. She was in the last cabin to be crushed before the Stockholm floated away. Unbelievably, the impact actually rolled her up in her mattress and she wound up safe within the mangled debris of the Stockholm’s crushed prow. My own personal miracle had taken place the day we left Genoa when I was forced to change my cabin. Had I not changed quarters I would have been killed in one of the cabins that was completely destroyed. The actual length of the gash was 40 feet wide through seven of the Andrea Doria’s eleven decks. My first appointment back in the States was to St. Mary’s in Annapolis, Maryland. It was there that I began a long career of “Sinking the Doria” starting at the Naval Academy and working my way through many Communion Breakfast talks, Society Dinners, Guild Luncheon’s, and so forth. And now, with the resurgence of public interest in the Titanic, I am looking forward to the year 2006 which will be the 50th anniversary of the sinking of the Andrea Doria, when the Doria-Lecture may well begin all over again.